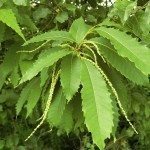 I planted a 2 -3 ft red horse chestnut tree in 2010. When should I expect blooms? You should been having flowering from this tree. Review the growing conditions and the fertilizer requirements in the links below.